the time traveler's wife. | escaped. 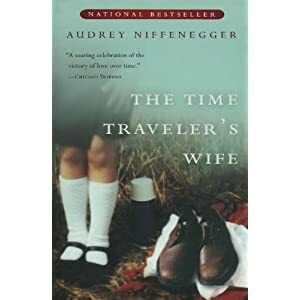 This evening I just finished reading The Time Traveler's Wife, for the first time. I cried 3 times, I'm not kidding. Now I know this is late; everyone has probably read the book and seen the movie but I just can't help it - this is the best romantic novel I've ever read. I've always opted for lighter, chick-lit humorous books (who doesn't love entertainment?) but sometimes I like books that I can relate to. This book is one of the most insightful looks in relationships I've ever read. I fell in love with Henry; and I love how the author doesn't potray him as this perfect-gorgeous-nothing-can-beat-him kinda guy; well he's still gorgeous but sympathetic at the same time. I take my hats off to Clare; she comes off as this strong, very patient woman who fell in love with a guy who's not ordinary and willing to accept everything about her man. If you want to lose yourself in a helplessly romantic story, this would be it. I don't know about the movie though; watched it but as usual the books would always be better than the movie version. I'd say it's watchable. A bit different from the book, and I'm not very happy with the ending. Regardless, this book made me think - it's not fair that someone could meet a dead person after his death. It's like, cheating nature. I'd know, because I've always dreamed of having that chance. i added u at facebook..why no approve..
but it is still good though! sepanjang mubi tuh asyik camni jek--->(>.<)?? pena : best gila kann.i love the storyline! anon : ure back!haha.tula susah nak fhm klu xbace kot.i saw the movie once before bace,pening gile.haha. aku mmg pembace blog ko yg setia lah..siap follow lg. @li : sweet kann.but id definitely recommend you to read the book,its one of those i truly enjoyed :) looking forward for more books like this in the future.